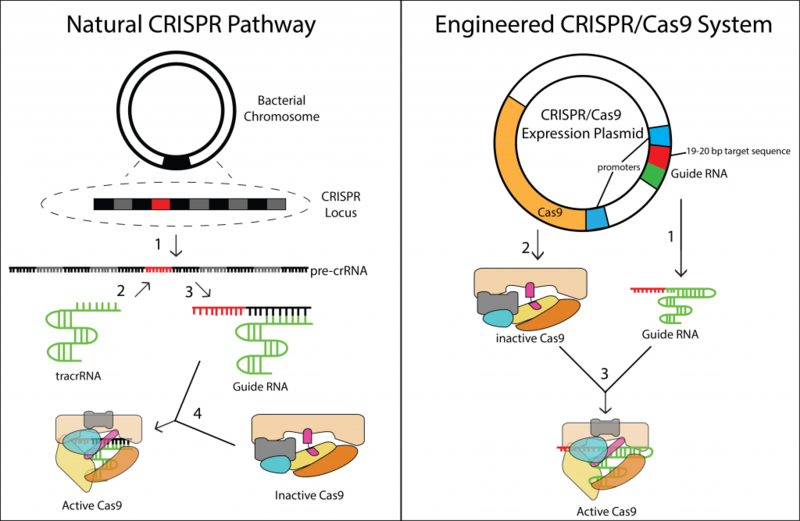 CRISPR/Cas9 systems are engineered versions of the Cas9 protein and guide RNA. Typically, they are identical to the Streptococcus pyogenes type II CRISPR systems, except that a single guide-RNA is used in place of the complementary crRNAs and tracrRNAs of the natural CRISPR system, and the Cas9 protein is codon-optimized for the cells intended to be transfected with the CRISPR/Cas9 system (Jinek et al. 2012). For example, CRISPR/Cas9 expression plasmids used to edit the genome of human cells have codons optimized for human cells, and thus are called humanized Cas9 (hCas9) (Mali et al. Feb 2013). 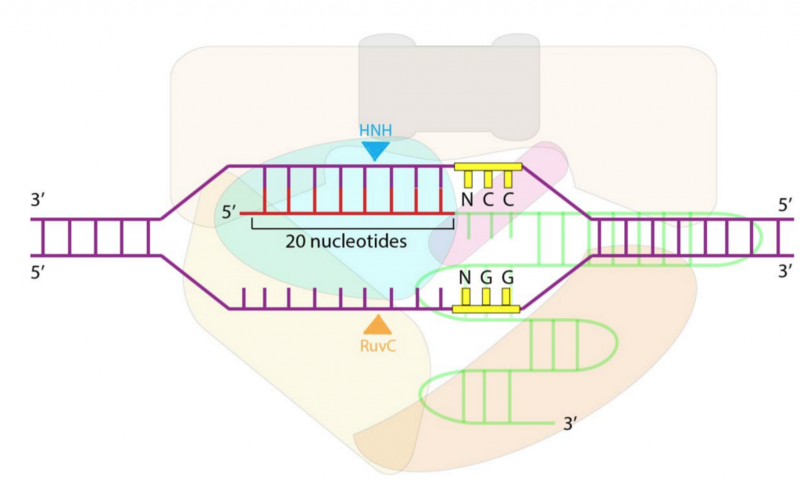 As the guide RNA sequence determines the cut site of the Cas9 nuclease with high specificity, the re-targeting of the CRISPR/Cas9 system to new sequences is far easier than re-targeting other engineered nucleases such as TALENs (transcription activator-like effector nuclease) or ZFNs (zinc finger nuclease). In fact, the cut site of a guide RNA-Cas9 nuclease complex can be reprogrammed to target just about any site that occurs immediately before a PAM sequence (5′-NGG-3′) (Cong et al. 2013). In addition, the efficiency of the nuclease is comparable or greater than that of TALENs or ZFNs, which is remarkable given the high specificity of the nuclease (Mali et al. Feb 2013). To understand how this high specificity and high efficiency are possible, check out our mechanism page. Cas9, as a double-stranded DNA nuclease, can be used in conjunction with Homology-Directed Repair to insert new genes or DNA sequences into a genome (Mali et al. Feb 2013). There are two distinct nuclease domains in Cas9 and therefore mutations in the active site of one nuclease can produce a DNA nickase that produces single strand breaks (Gasiunas et al. 2012). Mutations in the active sites of both nuclease domains results in a non-catalytic Cas9. This protein-RNA complex can bind specific sequences of DNA and localize other effector molecules to that region of DNA, which can carry out Transcriptional Control of the genome (Jinek et al. 2012). So in essence you manipulate the inactive transcripted nuclease in order to mutate the rna via molecular charge whereby the neurons in the inactive nuclease begin a mutative proccess to eradicate the inacctive rna and in essence grow a new strand of DNA.